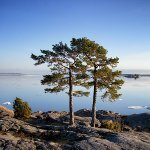 Finnish Nature Day is an annual holiday dedicated to the uniqueness of Finland’s nature. It is celebrated on the last Saturday of August. In 2017, Finnish Nature Day was declared an official flag day, alongside holidays such as Mother’s Day and Kalevala Day. Finnish Nature Day was celebrated for the first time in 2013. The main ceremony took place at Nuuksio National Park, it featured a speech delivered by the then-Minister of the Environment Ville Niinistö. Currently, the patron and ambassador of Finnish Nature Day is the First Lady of Finland Jenni Haukio. The Ministry of Interior designated Finnish Nature Day as an official flag day in 2017 in honor of the 100th anniversary of the country’s independence, making Finland the first country to celebrate its nature in such a way. Main goal of Finnish Nature Day is to emphasize the key role that nature plays in the life of Finns, as well as to raise public awareness of the importance of preserving natural resources and the environment. Alongside flag-raising ceremonies held throughout Finland, the celebration of Finnish Nature Day includes live concerts held at national parks, picnics and open-air dinners, and other events organized by environmental organizations and activists. By the way, everyone’s right to enjoy the Finnish nature freely is a legal concept in Finland. According to Finnish law, everyone has the right to walk, cycle or ski freely, except very near private residences, or in fields and plantations which could easily be damaged.